All of our low prices include delivery locally to Wigan and Greater Manchester free of charge! 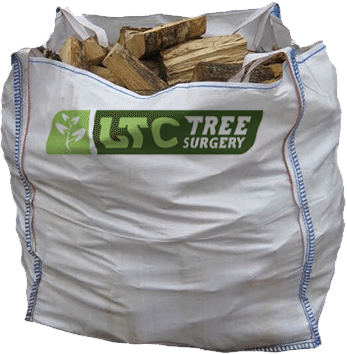 For only £65 for 250kg, LTC can provide for all of your firewood needs. As a result of an increase in stockpiles, LTC Group has a huge range of seasoned logs for sale in Wigan and Greater Manchester. All of our logs for sale are fully dried and perfect for firewood, and can be arranged to be delivered straight to your door immediately, free of charge. LTC Group are professional tree surgeons, and guarantee that all of our logs for sale are dry stored and checked thoroughly before delivery, to ensure that our seasoned wood is excellent for burning. Seasoned logs are suitable for many domestic uses. In addition to being perfect firewood for garden fires or home wood burners, our logs can also lend themselves well to aquariums, ponds, or for general décor purposes. All of our logs are cut by LTC Tree Surgery to a manageable size, making them perfect for any home or garden fire. Our seasoned logs are taken from work that we have previously carried out at customer’s homes or businesses and are of excellent quality. If you require a smaller amount of our firewood logs, contact us and let us know the amount when you call. We pride ourselves on stocking quality wood and great customer service, and can arrange for logs to be cut to your requirements if necessary. Need a selection of logs of a certain size or shape? Contact us now! Here at LTC, we offer a speedy and reliable service when delivering seasoned logs for sale. Working across the Wigan and Manchester areas and further afield, we cater to both commercial and domestic customers, and are ready to provide you with firewood when you need it. As a professional company who regularly removes trees and stumps, we can end up with many excess logs which must be disposed of. Through this, we have obtained a fantastic range of logs that, with the proper drying treatment, are ideal for use as either firewood or decorative purposes. All of our logs can be adjusted to suit your requirements – you can even specify the length of log that you require, so that they can fit your wood burner or fire pit. Contact us today to discuss our options of logs for sale. Looking for logs to be delivered to a home address in Wigan or Manchester? Let us know your requirements, and we can organise delivery to fit you. We also deliver logs in Chorley, St. Helens, Skelmersdale and Bolton.